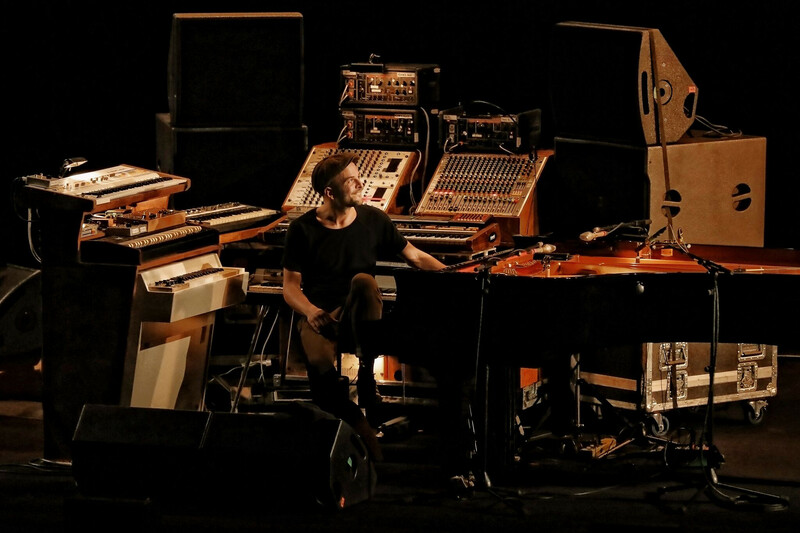 Nils Frahm Live review ( Sydney Opera House, October 14) | Daily Review: Film, stage and music reviews, interviews and more. Nils Frahm is a classically trained German pianist whose contemporary classical and ambient records and concerts are produced via an astonishing array of synthesisers, especially Rolands and Moogs, and of course piano. I enjoy experimental music, especially live if it’s good, but at home, if I put anything on that isn’t “song” based (verse, chorus, verse), it tends to be something noisy. However, I’ve been listening to Frahm quite a bit lately, especially the album Spaces (2013), a collection of pieces recorded live over the two previous years and his new album All Melody. Frahm is not for those whose tastes are limited to “catchy tunes” and that includes the traditional symphony, but for lovers of expertly crafted keyboard melodies (with some synthetic rhythm thrown in), he may be for you. Especially in a live setting. Seeing him put together his work surrounded by about eight keyboards is really something. He transports you to a warm place in the back of your mind if you abandon yourself to the music and go with the flow. The show began with The Whole Universe Wants to Be Touched from All Melody played without the human voices that appear on the recorded version. A number of what Frahm does call songs on All Melody include male and female singers chanting. Another number from All Melody played later in the night called Human Range and saw Frahm trigger the vocals via a key on one of his Rolands. It wasn’t long before Frahm produced for us some of his driving electronica that forms a good portion of his oeuvre. The volume of last night’s gig was way up to 11 and was at times as noisy as any of the dissonant electronica found on Mike Patton’s Ipecac Recordings label. On the music lesson front, Frahm self-deprecatingly informed us of the thinking (according to him, not too much) behind some of his pieces. He spoke about a dynamic that appears on a number of his songs where he sets ups an electronic rhythm which often stays unchanged for several minutes while he goes from keyboard to keyboard creating melodies. A template for this is his popular song Says which was one of the highlights of last night’s performance. Aside from Says the highlights of the concert were the mostly organic piano pieces, the soothing, My Friend the Forest from All Melody and the frenetic lines of old favourite Hammers. It was a fantastic performance with a significant portion of the selected pieces dedicated to groove.